Mercedes says most of its dealers lack experience selling heavy-duty trucks such as the Sprinter. 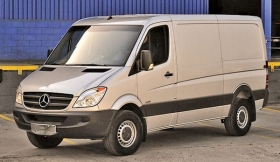 CHARLESTON, S.C. -- Mercedes-Benz is encouraging its U.S. dealers to use a non-Mercedes approach as they start selling the Sprinter commercial vehicle. The advice: Hit the streets. Most U.S. dealers have no experience selling a full-sized, heavy-duty truck to the commercial market. "You have to go out. You have to see these guys. Let them test drive the vehicle," said Ernst Lieb, CEO of Mercedes-Benz USA, who was interviewed last month at a Sprinter event here. About 70 Mercedes dealers have been selling the Sprinter since Jan. 1. Mercedes' parent, Daimler AG, terminated contracts with nearly 350 Dodge dealers last year. Fiat took control of Chrysler last year and plans to offer vans based on Fiat vehicles. Mercedes and its Freightliner affiliate sold a combined 1,937 Sprinters through April, up 6 percent from last year, when Dodge and Freightliner sold Sprinters. For all of 2009, Dodge and Freightliner sold a 8,353 Sprinters; Dodge says it sold 7,154 of them. This year Mercedes reduced the Sprinter's price by up to 6 percent. Now it wants dealers to target the commercial market. Last month Lieb told the Sprinter dealer board that selling vans is different from selling cars. "This is not a waiting game," Lieb said he told the board. With passenger-vehicle sales, "We attract the customers; they come into the showroom, buy, and everybody is happy. That is not the way it works" in the commercial market, he said. Mercedes has signed 71 Sprinter dealers and wants to reach 100 by year end. It wants 60 to 70 Freightliner dealers by year end, up from 49 now. "We think we can cover the business with about 160 dealers," Lieb said. Pete Blackwell, general manager of Mercedes-Benz of Cutler Bay in Cutler Bay, Fla., said his dealership hired a salesman with experience selling trucks and has sold eight new Sprinters since January. Said Blackwell: "He spends as much as 50 percent of his time taking Sprinters to commercial businesses."